After Priyanka Chopra, it was now the turn of Preity Zinta to grace the sets of Jhalak Dikla Jaa 5. 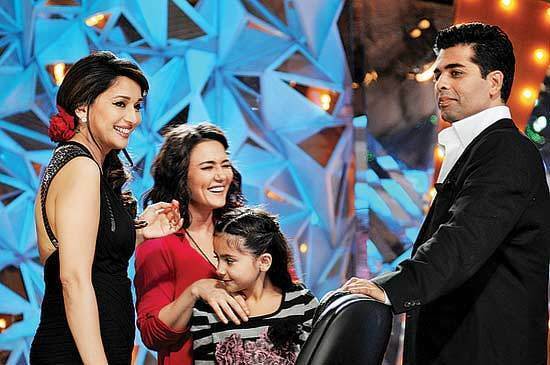 The actress was seen having a good time with judges Madhuri Dixit and Karan Johar. Few days back Priyanka Chopra also visited the Jhalak sets to promote her movie Teri Meri Kahaani. Preity is currently busy shooting for her upcoming movie Ishkq in Paris which is also her home production. It was not clear as to why Preity was on the sets. Was it to meet good friend Karan Johar or promote her upcoming film? Ishkq in Paris releases on 21st September worldwide. Check out the picture of Preity Zinta with Madhuri and Karan from the sets of Jhalak! Amitabh Bachchan and Preity Zinta can’t stop praising each other! Preity Zinta can’t thank Salman Khan enough!